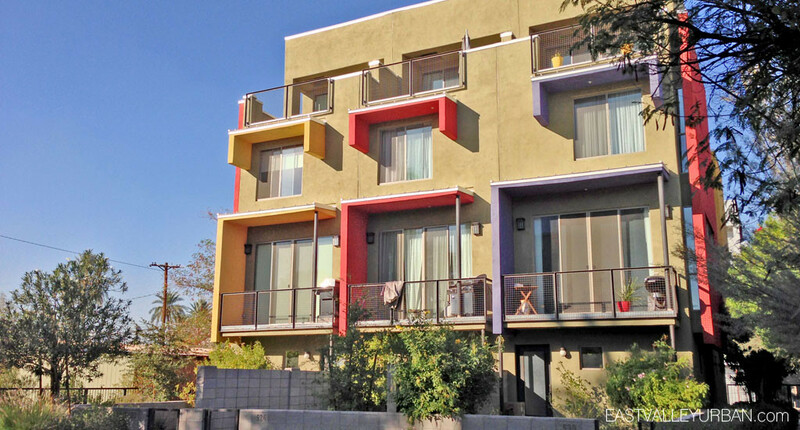 Portland 2 is a 25-unit contemporary development on the border of Mid-Town Phoenix and Downtown Phoenix. Located just off 7th Street and the I-10 Freeway, Portland 2 is perfectly nestled in an ideal location to access all that Phoenix has to offer. Portland 2 is a development by DesertWise Builders, a partnership between Bob Kapci and Brent Linnenkamp founded in 2008. This development has been constructed in 2 phases. Phase I started in 2007 and consisted of approximately 5-units. The 2nd phase just picked up second half of 2012 to complete the remaining 20. Each home is a 3-story, 2 or 3 bedroom townhome with an attached 2-car tandem garage. All the floor plans will range in size from 1,574 to 1,985 square feet. The main level will feature the kitchen, dining and living rooms. The next level will consist of two bedrooms, two bathrooms and a stackable washer and dryer and the upper-level will house the master-suite and large deck offering great views of the surrounding skyline. Looking to sell a property at Portland 2?